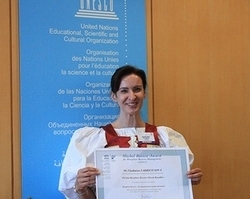 UNESCO and its Man and the Biosphere (MAB) programme afford recognition to outstanding contributions in the management or preservation of the environment; honour successful management of biosphere reserves in line with recommendations of the Seville Strategy; and foster access for young scientists, especially women, to advanced research facilities through respective prizes and awards schemes. These are the UNESCO Prizes managed by the MAB Secretariat (click here for other UNESCO Prizes). The purpose of the UNESCO Sultan Qaboos Prize for Environmental Conservation is to afford recognition to outstanding contributions by individuals, groups of individuals, institutes or organizations who have contributed to environmental and natural resources research, environmental education and training, creation of environmental awareness through the preparation of environmental information materials and activities aimed at establishing and managing protected areas including in relation to sustainable tourism, such as Biosphere Reserves, natural World Heritage sites and UNESCO Global Geoparks. The objective of the Prize is in conformity with UNESCO’s policies and is related to the Programme of the Organization in the field of environment, natural resources and education for sustainable development. The deadline for submission of application forms for the 2019 UNESCO Sultan Qaboos Prize is 15 July 2019. Nominations for the Prize can only be made by UNESCO Members States with consultation of their National Commissions, and by Non-Governmental Organizations maintaining official partnerships with UNESCO, and active in relevant fields covered by the Prize. Other interested NGOs, research institutions, universities and individuals, are not eligible to make nominations directly to UNESCO. Therefore, such bodies and individuals are invited to propose their candidate to their country National Commission for UNESCO, which may or may not select it as its formal candidature. Candidatures should be prepared in English or French. A self-nomination cannot be considered. 2001: Chad Association of Volunteers for the Protection of the Environment - A.T.V.P.E. Since 1989 MAB has been providing young researchers each year with awards of up to US$ 5,000 in support of their research on ecosystems, natural resources and biodiversity. Through the MAB Young Scientists Awards, MAB is investing in a new generation of scientists worldwide because we think well-trained and committed young people are key to addressing ecological and sustainability issues. 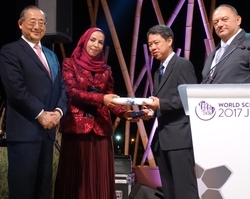 The International Coordinating Council of the Man and the Biosphere Programme (MAB-ICC) at its 29th session on 12-15 June 2017 adopted the new criteria and conditions for the selection of MAB Young Scientists Award winners in order to address the Lima Action Plan (LAP) for Biosphere Reserves and relevant Sustainable Development Goals (SDGs) in applications. The deadline for submission of application forms for the 2019 MAB Young Scientists Awards is 15 December 2018. The International Co-ordinating Council of the Man and the Biosphere Programme (MAB-ICC) endorsed seven winners for the MAB Awards for young scientists during its 30th session on 23 - 28 July 2018. Note that applications must be received by UNESCO no later than 15 December 2018 to be eligible. The MAB Young Scientists Awards targets young researchers carrying out interdisciplinary research in line with UNESCO's Man and the Biosphere (MAB) Programme. Priority is given to projects carried out in biosphere reserves. Until 2025, implementation of the UNESCO MAB Programme is guided by the MAB Strategy and Lima Action Plan for UNESCO’s MAB Programme and its World Network of Biosphere Reserves (LAP), which contributes to the achievement of the 2030 Agenda and its Sustainable Development Goals (SDGs). MAB Young Scientists Award applicants are strongly encouraged to take into account the priorities of the LAP, and to identify in their applications how their research contributes to the research-related actions of the LAP and to the SDGs. enhance awareness among young scientists of the role of research in the implementation of the SDGs – in particular when conducted in biosphere reserves. To be eligible, award applications must be made on the MAB Young Scientists Award application form (in English or French) and follow-up technical requirements stated there. The application must be endorsed by the applicant's MAB National Committee*, which may endorse only two applications per year from applicants who are not older than 35 years of age (at the closing date of the application). Applications must contain concise information on past and existing research in areas concerned in order to present linkages and avoid duplications and financing of projects already carried-out. Priority is given to interdisciplinary projects carried out in biosphere reserves designated under the Man and the Biosphere Programme or potential biosphere reserves and which contribute to the implementation of the LAP and the SDGs. In this regard, applicants shall identify in their applications if and how their research contributes to the research-related actions of the LAP and to the SDGs. Applicants from developed countries are eligible for Awards only in exceptional cases or if working in joint partnership with developing countries. Awards are set at a maximum of US$5,000 each. Research supported by an Award should be completed within two years. Candidates must accept to submit reports of Award-funded research to the MAB Secretariat in Paris and to their MAB National Committees*, and agree to the possibility of UNESCO publishing the results of their research. International travel expenses are usually not covered under these Awards. * For the countries in which a MAB National Committee does not exist or is not fully operational, the National Commission for UNESCO will ensure the selection of candidates according to the above criteria. The 2019 Michel Batisse Award call is now open! This award is given every two years during the MAB Council, in memory of Dr Michel Batisse, for outstanding achievements in the management of the biosphere reserves in line with the recommendations of the Seville Strategy. The deadline for submission of application forms for the 2019 Michel Batisse Award is 20 January 2019. The deadline for submission of application forms for the next Michel Batisse Award is the 20th January 2019. Following the decision made by the MAB Council at its 29th session in June 2017, case studies must be submitted for every two MAB-ICC Council session due to be convened. Next Michel Batisse Award will be given when the MAB Council meets in 2019. All case studies must be submitted through, and have the endorsement of, the respective MAB National Committees, and/or the UNESCO National Commissions of the country concerned. Only one case study by country is accepted. Award amount: US$ 12,000 plus international travel and allowances in Paris, France, to present the award winning case study to the MAB-ICC session concerned. Process for submitting applications: Each country can submit one case study on biosphere reserve management, not exceeding a maximum of 30 pages (20 pages recommended) and appropriately illustrated with scientific data, figures and tables, photographs and other supporting documentation. The 2016 Michel Batisse Award for a case study concerning the management of a biosphere reserve goes to Qu Shuguang (China), Director of the Wudalianchi Biosphere Reserve, for his study on the Wudalianchi ecomigration project to protect the environment and improve the population’s means of subsistence. The 2015 Michel Batisse Award for a case study concerning the management of a biosphere reserve was attributed to Bandi Namkhai, Director of the Khustain Nuruu Biosphere Reserve in Mongolia, for his study of Khustain Nuruu. The 2014 Michel Batisse Award was attributed to Ana Luisa R. Figueroa (Mexico), for her case study on "A group of fishermen and fishing families who became guardians of the San Pedro Martir Island, part of the Islas del Golfo de California Biosphere Reserve". The Michel Batisse Award for Biosphere Reserve Management was attributed to Marisa Coetzee and Harry Biggs (South Africa) for their case study concerning the South African Kruger to Canyons Biosphere Reserve.